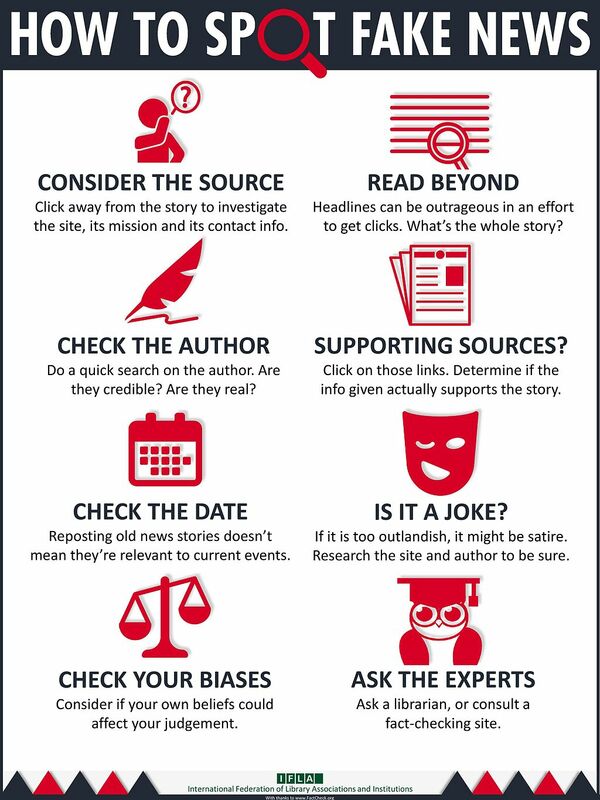 This guide is intended to assist student researchers identify fake news in the news, media and websites. The criteria from the International Federation of Library Associations and the C.R.A.A.P. Test Worksheets will assist with identifying fake news. According to the fact-checking website, Politifact, "Fake news is made-up stuff, masterfully manipulated to look like credible journalistic reports that are easily spread online to large audiences willing to believe the fictions and spread the word." Alternative/Alternate Facts - A different interpretation of facts, usually derived from a misinterpretation of reports or by focusing only on a subset of the available information. Fake News and Alternative Facts: Finding Accurate News, Austin Community College LibGuide, 2018. If you need assistance, please contact any of the SJC Librarians. C.R.A.A.P. worksheets were originally developed at Merriam Library. California State University. Chico. "We are the most comprehensive media bias resource on the internet. There are currently 2200+ media sources listed in our database and growing every day. Don’t be fooled by Fake News sources". Media Bias/Fact Check. 2015. Website. 20 February 2018. Hillsborough Community College Libraries. Tampa FL. January 25, 2018. Media Matters Staff. "MediaMatters for America." May 2004. mediamatters.org. Article. 22 February 2018. MisinfoCon / Trust, Verification, Fact Checking & Beyond.